Deep in Earth's interior is a dynamo that creates the planet's magnetic field--a kind of generator driven not by spinning turbines but by swirling flows of liquid iron. The workings of this dynamo cannot be observed, but scientists have used computer simulations to gain powerful new insights into the operation of the "geodynamo" and the behavior of Earth's core. 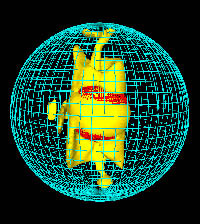 This computer model shows the region (yellow) where the fluid flow in Earth's outer core is the greatest. The core-mantle boundary is the blue mesh; the inner core boundary is the red mesh. Large zonal flows (eastward near the inner core and westward near the mantle) exist on an imaginary "tangent cylinder" due to the effects of large rotation, small fluid viscosity, and the presence of the solid inner core within the spherical shell of the outer fluid core. Visit Glatzmaier's Web site for more information and computer renderings. The first self-consistent, three-dimensional computer simulation of the geodynamo was achieved in 1995 by professor of earth sciences Gary Glatzmaier, then at Los Alamos National Laboratory, and Paul Roberts, professor of mathematics at UCLA. Glatzmaier, Roberts, and their coworkers have since refined and extended their simulations, shedding new light on the planet's inner workings. Glatzmaier presented the group's latest findings on Sunday, February 20, at the annual meeting of the American Association for the Advancement of Science in Washington, D.C. His collaborators include Robert Coe, professor of earth sciences, and postdoctoral researcher Lionel Hongre. The Glatzmaier-Roberts model of the geodynamo is essentially a complex set of equations describing the physics of Earth's core. Scientists had long speculated that the mechanism behind the geomagnetic field involved the motion of the Earth's fluid outer core, which surrounds a solid inner core. Both are composed mainly of iron. The solid inner core is about the size of the moon and as hot as the surface of the sun. The flow of heat from the core ultimately drives the geodynamo. "Basically, the whole thing works because the Earth is cooling off," Glatzmaier said. The cooling process results in fluid motions in the outer core that produce an electric current, which, like any electric current, generates a magnetic field. One of the initial achievements of the Glatzmaier-Roberts model of the geodynamo was the simulation of a reversal of Earth's magnetic field, when the north and south magnetic poles trade places. This phenomenon has occurred many times in the history of the planet, according to paleomagnetic records preserved in rocks that show the direction and strength of Earth's magnetism at the time the rocks formed. "We were able to get a magnetic field generated by the model that looks a lot like the Earth's and undergoes reversals," Glatzmaier said. The model also predicted that the solid inner core should rotate slightly faster than the surface of the Earth. This prediction was later supported by other researchers using evidence from seismic waves that pass through the core. Over the past five years, Glatzmaier and his coworkers have improved the precision and resolution of their model, taking advantage of advances in computer capacity. They have now run simulations spanning as much as 300,000 years and showing a pattern of magnetic-field reversals very similar to that seen in the paleomagnetic record. "We can run the simulation for 200,000 years and the magnetic field will be stable for a very long time--millions of time steps for which we solve these equations. Then within a thousand years it reverses polarity, and then it remains stable again for another long period. We were very happy to see that, because that's also what we see in the Earth's record," Glatzmaier said. He noted that the reversals are not triggered by an external influence on the geodynamo. "It is simply due to the very nonlinear, chaotic nature of the dynamo system," he said. The group's most recent efforts have focused on the role of the mantle in controlling the frequency of geomagnetic reversals. Temperature variations in the mantle, causing an uneven pattern of heat flow from the outer core into the mantle, may affect the fluid dynamics of the outer core. So Glatzmaier's group ran their simulation using eight different patterns of heat flow across the core-mantle boundary. The results, published in the October 28, 1999, issue of the journal Nature, showed that the pattern of heat flow determined by the mantle does have a big influence on the behavior of the geodynamo. The most Earthlike pattern of magnetic-field reversals occurred with a relatively uniform heat-flow pattern. This suggests that scientists may have overestimated the extent of thermal variation in the mantle, or that variations in mantle composition may compensate for thermal variations. "We're still far from satisfied that we have all the answers," Glatzmaier said. "The model is a way of exploring the unknown, and it looks very promising because the results are so much like the real magnetic field. But we have less confidence in the details, and that's where more powerful computers will help."